Before we get started, I would first like to introduce myself. My name is Justin, better known as Dr. Cumulus. I am a storm chaser for my company, Justin’s Wild Weather Adventure, Where Learning Is An Adventure. For many years, I have been intrigued by the weather. When I was in the Air Force, I was assigned to be Security Forces, but everyone could clearly see what I was made for. I was born in California, raised in Texas and came to Oklahoma on July 4th, 2011. I have been storm chasing for many years and my life focus is actually on teaching weather to the world. I plan on attending the University of Oklahoma one day, going all the way through my PhD. Anyway, enough about me, let’s get to the story. As we all know, summer is here and there is a lot you can do to have a great time. You can go to Lake Hefner for a nice swim, Lake Thunderbird for camping and fishing, or have barbeques. Perhaps the best part of summer is not having to worry about classes or anything, unless you chose to take summer classes. However, you do want to be safe in this summer. Though temperatures have not been anything like they were last year at this time, that is not to say they won’t return. In southwest Oklahoma, towards Altus and the surrounding area, they have already seen temperatures in the 100’s more then three times. That is pretty hot. Just because the wind blows and cools off some does not mean you are 100 percent safe. In fact, too much exposure to the sun can lead to skin cancer. This is because just like in the hospital, if you are exposed to too much radiation, it can affect your health. With that in mind, be sure to have some kind of sunscreen on if you plan on relaxing in the sun. Now, I know some of you will be working outdoors, some of you more than others, like construction crews and landscapers. Please, though you might be “used “ to the extreme heat, have plenty of water available at all times. Take regular breaks. You can suffer heat exhaustion, or worse, possible heat stroke. When I was in the Air Force, it was difficult to survive many days, but by drinking plenty of water and taking care of myself, I made it through. Don’t try skipping your lunch break just to try getting done with the work early. You have worked hard enough, reward yourself with a break. However, remember if you drink too much water, it can be dangerous. You don’t want to over hydrate. Avoid sodas and other carbonated drinks. These can provide too much sugar, and in extreme heat, too much sugar can become fatal. I tell you these things not so I can scare you, but so you can go home at the end of the day with a clean bill of health. However, there are other ways to play it safe in the extreme heat that does focus on your health. Instead, it becomes more about life and property. Though not all of Oklahoma is an extreme drought, with the exception of parts of Texas and Beaver county, fires can still happen at any time. If you work in the welding industry, you know just how easy welding can start a fire. Please watch your sparks carefully. If you smoke, you need to be careful too. Do not throw your cigarette on the ground; assuming you destroying it has not eliminated the problem. In fact, it still has embers, sometimes that you can’t see. If these come into contact with dry vegetation, it could create a fire. For all my grill masters out there: though you might love grilling and having parties, use some common sense. Don’t grill under a tree, alongside a building, or next to a field. Try finding somewhere isolated from where a loose burning ember could freely burn and not risk life or property should you decide to grill. Adhere to all burn bans. They are in place for a reason. 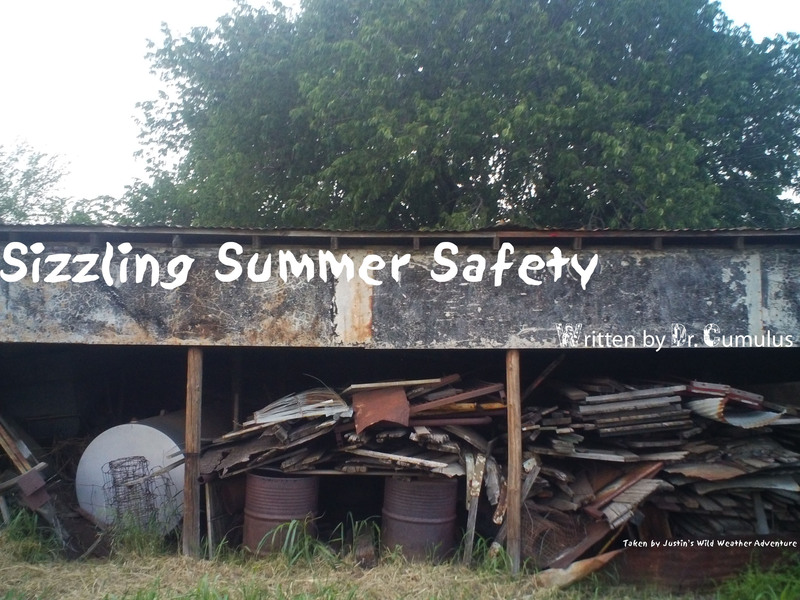 There is a great summer ahead, but only you can make it fun and safe for everyone. We did cover a lot today, but you see, when it comes down to it, safety can never be emphasized enough. I am sure many of you have heard these same lectures when you were still young and probably still hear them regularly. Please don’t just listen to these words, apply them. Now get out there and enjoy your summer. If you are taking summer courses, we look forward to seeing you here. Take care everyone, talk to you next month.